Do you know a family or friend that can use a helping hand? 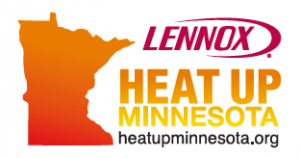 For the fifth year in a row Lennox dealers across Minnesota are participating in the annual Heat Up Minnesota campaign. Heat Up Minnesota installs new, high-efficiency furnaces for families who have fallen on tough times for reasons beyond their control. Loss of job, health issues, sudden unplanned expenses and other reasons can suddenly put a family in a tough financial position. These are normally families that are not receiving any special benefits from government programs, just regular folks that get hit with an unplanned financial challenge. What makes this campaign so special is it is neighbors helping neighbors, not a government program. Since 2012 over 200 of your Minnesota neighbors have received a new Lennox furnace absolutely free of charge. To nominate a family to receive a new Lennox furnace, all you have to do is go to www.heatupminnesota.org and complete a short nomination form. Nominations can be submitted now through Friday, September 22nd. Please email them to ljoeguck@esserinc.com. Please join Lennox Industries and your local Minnesota Lennox dealer, Aire Serv of Lakes Country, An Esser Family Company as we prepare to once again help our Minnesota neighbors! If you know of a family that can use a helping hand, nominate them today.